Have you ever noticed the use of the word exponential in our daily life? It is used to express something which is rising or increasing at a steady and a usual rapid rate or something which increases quickly by large amounts. (i) Prices have increased exponentially i.e. at an exponential rate. (ii) The budget is increasing at an exponential rate. (iii) We all want to progress exponentially and achieve success in our lives. Something is said to increase or decrease exponentially if its rate of change must be expressed using exponents. A graph of such a rate would appear not as a straight line, but as a curve that continually becomes steeper or shallower. In Math, it refers to a Mathematical (function, curve, series, or equation) containing, or involving one or more numbers or quantities raised to an exponent. 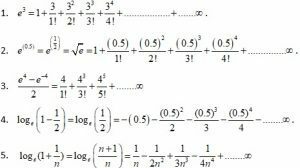 So, here we try to identify what does Exponential series mean in mathematics. A sequence is a list or arrangement of numbers in a definite order written according to some rule or pattern. If the n terms of the sequence are a1, a2, a3, a4, ……., an then the expression a1 + a2 + a3 + a4 + ……. + an is called the series associated with the given sequence. is called the Exponential series, x ∈ R. Here ex is called the exponential function. Here e is an irrational number such that 2 < e < 3. Note: loge(1 + x) is defined for x = 1. Now let’s consider some examples on exponential and logarithmic series.